Welcome to the Million Dollar Journey December 2017 Financial Freedom Update – the final update of the year. For those of you new here, since achieving $1M in net worth in June 2014 (age 35), I have shifted my focus to achieving financial independence. How? I plan on building my passive income sources to the point where they are enough to cover our family expenses. All within the next 5 3 years. Reaching this goal would mean that my family (2 adults and 2 children) could live comfortably without relying on full time salaries. I would have the choice to leave full time work and allow me to focus my efforts on other interests, hobbies, and entrepeneurial pursuits. In September, I wrote about being laid off for about 30 seconds from my government job after which I was given a temporary position for a few months. The quarter has passed and I was given an extension for another quarter. Since that time, I’ve been in talks with a number of potential employers, mostly from my professional network which has resulted in a number of leads. Looking back through my career since graduating with my Engineering degree, my experience has shown that building a network is extremely important in career development. In fact, I’ve had 3 careers since that time, and all three have been a result of utilizing my network. Now I’m on my way to my fourth (maybe final?) chapter in my career – perhaps I’ll have some news on this in the next quarterly update. Now, let’s talk a bit about my passive income strategy – generating dividend income. As dividends are the main focus of my passive income pursuit, there is a large dependence on the market. While there are merits to this investment strategy, there are also substantial risks – particularly dividend cuts. For example, look at what happened to Home Capital Group (HCG) earlier this year. HCG is a secondary lender who had a very strong track record of dividend increases (18 years in a row). HCG funded their mortgages through client deposits into GICs and high-interest savings accounts. With the company under investigation, client essentially made a run at the bank and essentially wiped out HCG’s high-interest savings balance. To help stop the bleeding, HCG obtained a very expensive line of credit. The deal was so expensive that it could end up wiping out a full year of earnings. In light of this, the company suspended their dividends in May. TD Bank (TD); Scotiabank (BNS); Magna (MG); Royal Bank (RY); CIBC (CM); Bank of Montreal (BMO); National Bank (NA); TransCanada (TRP); Great-West Life (GWO); Thomson Reuters (TRI); Manulife (MFC); BCE (BCE); Telus (T); Enbridge (ENB); Enbridge Income Fund (ENF); Canadian Utilities (CU); Canadian National Railway (CNR); Canadian Pacific Railway (CP); Exco Technologies (XTC); Suncor (SU); Thompson Reuters (TRI); Leons Furniture (LNF); First National Financial (FN); Power Financial (PWF); Transcontinental (TCL.A); Imperial Oil (IMO); George Weston (WN); Loblaws (L); Sun Life (SLF); CAE (CAE); Canadian Western Bank (CWB); Fortis (FTS); Empire (EMP.A); Emera (EMA); Finning (FTT); and, Metro (MRU). In addition to the dividend raises, I’ve continued to deploy cash into dividend stocks. What has really impacted this update is the creation of a non-registered dividend portfolio for my spouse (opened another account with MDJ reader favorite Questrade). There was some cash savings in her account that needed to be deployed, and I was able to get it invested in short order. As one of the goals of this particular account is to generate a high and reliable yield (spouse is in lower tax bracket), I am experimenting with the Dogs of the TSX strategy. Here is an update on the dividend totals per account. Some readers were questioning the value of “Yield on Cost”, so this update has the current yield on each portfolio. This also means that a more relevant “total invested” number is shown below. Before it was just my cost base, now it’s total portfolio value (ie. including capital gain). Through a combination of deploying cash, starting a new non-registered portfolio with savings, and collecting those juicy dividend increases, this quarter has been productive with a 9.82% bump in dividend income. I really do enjoy watching those dividends flow into the accounts. I ended 2016 with around $23,636/year in dividends, and I’m pleased finishing 2017 with dividends of $33,397 – almost a $10k increase year over year. Although I didn’t quite meet the lofty goal of $35k this year (although there still is a bit of time left), it was pretty darn close! 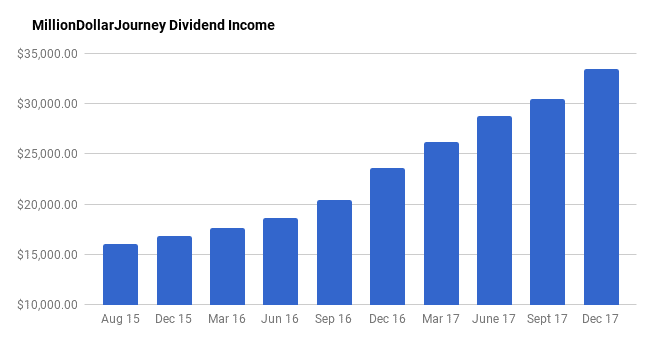 My plan is to keep the same pace and hit $45k in dividend income by the end of 2018. We still have a long way to go to hit $60k, but for the most part, we are moving in the right direction in surpassing the midway point of my long-term goal. There is still cash available to deploy in most of our accounts. In particular, the lump sum of cash from the commuted values of the pensions has started to be invested but still has a significant amount left to deploy. I hope that you also had a great financial year in 2017, and here’s to health, wealth and happiness in 2018! It looks like, if your portfolio had double the value, you would be generating the amount of income that you target. If that were the case, would you be retiring? At that point, would you want a higher portion of you portfolio to be invested in bonds so that you can reduce volatility in the value of the portfolio? Hi Ian! I’m a fan of dividend growth investing, so I’ll likely keep a high portion of our assets in dividend stocks that pay a reliable dividend. But yes, if volatility is a short-term concern, then increasing bond allocation is not a bad idea! I have been doing some research and trying to plan for my tax strategy once I reached financial independence a few years after you (2025). Since I am following a similar strategy to generate dividends and have it funding my lifestyle without drawing down on my principal, this will ensure that I don’t run out of money when I retire. Assuming that both spouse have no other income, if we each earn about $50K in dividend income, we will pay almost no income tax because of the dividend tax credit for Canadian eligible dividends. My plan is to slowly withdraw from my RRSP account and maximize my TFSA contributions each year so that I keep my income tax at a low rate after I stop working. Do you have a tax strategy to keep your income tax bills low once you reach FI? I would be interested to hear about it. We seem to share a lot in common in terms of financial strategy. Like you, dividends and capital gains will be highly efficient with no other income. We have a mix of assets to optimize, reg/non-registered/ccpc. I’ll get a post together about tax strategy during early retirement. I like your approach. Withdraw from RRSP and add to TFSA along the way is what I also plan to do. However, I will be limited by the contribution limit on that year since I have always contributed the maximum to my TFSA and RRSP. I am reaching a point where I need to invest in non-registered accounts now. For example, instead of putting my tax refund back in my RRSP, I will invest it in a non-registered account. 1-Don’t you get taxed when you withdraw from your RRSP to put in your TFSA? Love your site! Thanks so much! Hi Jo, thanks for stopping by. 1. Yes you will get taxed on the RRSP withdrawal. Might be best to attempt this strategy during lower income years. 2. If you are high income, I would recommend keeping all dividend stocks in tax sheltered accounts. 3. Difficult to make a generic recommendation for investments. I would treat the corporate account as part of your big financial picture. Easiest would be to probably index the portfolio (consider tax efficient etfs – https://www.milliondollarjourney.com/a-super-tax-efficient-index-etf-portfolio-for-your-non-registered-account.htm). I’m just starting out on this path. This was a great read and some great motivation. Thank you! Thanks Gursheel! Would you mind sharing some of your financial goals? Thanks for stopping by and best of luck on your financial journey! I don’t think that it’s good to concentrate on dividend income only. While dividends are taxed less than income, they are still taxed more than capital gains. Not to mention how difficult it is to find good dividend stocks, which makes the risks of being concentrated in them quite high. So it would probably be a better choice to concentrate on a variety ETFs with some of them dividend-paying. You would generate more growth and pay less taxes when you need the money. Valid points Cristian but dividend income is only taxed higher than capital gains if you are in a higher tax bracket (Ontario: http://www.taxtips.ca/taxrates/on.htm). So yes, if you are higher income, then it’s probably best to keep your dividend payers in a tax-sheltered account. However, if you are considering early retirement, dividend taxation has a large tax advantage over capital gains, especially if the dividends are spread over 2 people. Wow FT, fantastic that you have a $1,000,000 portfolio! I hope to be there in about 6 years. You’re more than halfway to achieve your family expenses coverage. I forget, do you have your mortgage paid off (principle mortgage) because that should lower your annual expenses of $60K a year. Also congrats on renewing your contracts/ jobs, great to keep the inflow happening so that you have cash to deploy! I’m a big fan of dividends as well and prefer not to withdraw any of my holdings on an annual basis come financial independence time. Congrats on your achievement. You are progressing very fast to your target. I feel FI is kind of moving target for me. Just like you, we don’t have any mortgage any more, with two kids, I have calculated our annual expense is around $60K and originally I made it as my FI target. But then I realized that actually I will have to spend lot more with health care bills if I don’t have extended health insurance from work any more. It’s also unpredictable what we need to spend on kids. I just spend more than $3000 for my daughter’s OK lenses. And my daughter’s piano teacher is pushing for us to buy a grand piano for her. Even a second hand one will cost more than $10K. I am still debating if it’s really necessary. Now I have changed my target to $80K to make a buffer. I don’t want to quit my job and then found out that I have to work again. Hi May, yes predicting expenses can be tough. One strategy is to use $60k as your recurring expenses requirement, but build up lump sum savings before pulling the retirement trigger to pay for any unexpected expenses. Another thought is that even in the “early retirement” community, most still do something part-time that brings in an income. Congratulations on your investment success. Keep it up. I see you have investments in your RRSP, TFSA and Non Registered accounts. What order would you recommend investing in these? I am debating whether or not I should focus on investing in my RRSP or TFSA. I am 53 yrs old and plan on retiring in the next 10 years and plan on living off approx. 70% of my current income. Logically I would continue to invest in RRSP since I will be in a lower tax bracket when I withdraw funds but concerned about OAS clawback. Thanks for the Link. It reinforces what I already thought. I don’t have a defined benefit pension. My plan is to continue to contribute to my RRSP since I am in a higher tax bracket now than when I plan on retiring. Any tax refunds/found money will go into my TFSA. Sounds like you have it figured out Nick! All the best and Happy New Year! Wow, I am amazed how you continue to strive further after having accomplished your net worth goal. Kaizen approach at its best! On another note, your dividend increase graph at the moment, seems like my Net Worth graph, lol. Hope to see the other side some day (its a long journey, but one that I will make). Thanks for the kind feedback. Here’s to Health, Wealth and Happiness in the New Year! First of Thanks for sharing your journey with us. This is really a good year as your chart is progressive all through. I totally support your plan or the need to generate passive income. That is what makes retirement age to be sweet and not just the money stacked in savings account. Thanks for stopping by Michael. Great thing about index investing is that no matter where we are globally, we’ll likely have a similar indexed portfolio. – I’m the main income earner in the family. – Can I still use the S.M. if we are mortgage free? I would open an unregistered account, borrow say $150,000 initially to get my feet wet….could the interest I pay against that heloc loan be written off, even if I have no active mortgage? – My wife and I co-own our home. Could I open an unregistered investment account in her name, borrow the 150k against the home, have her “trade/invest” it, and she could claim the income and write off the interest charges…is that ok? – Does the full amount of the heloc have to be invested at any given time, or can the investment account hold cash? – Are there special forms at tax time to fill out to indicate you have borrowed against your home to invest so that you can write off said interest charges on the heloc? Really appreciate your time on this! I’d love to get this started for my wife (if it’s allowed) as she currently earns zero income…I don’t see why it shouldn’t be considering both our names are on the home title (I’m more wondering if I might have to split the tax burden with her considering we both own the home, or if she can claim it all if the investment account is in her name). HI Dave, SM is simply borrowing against real estate to invest in the stock market. So yes, you could borrow against your house, invest in the market and your interest would be tax deductible. About the trading account, although tax-wise it would be ideal to have it under her name, but I think CRA would look at where the funds came from. IF you both own the house, it may be best to both be on the account. While you will both pay tax on the trading profits/dividends, you will also split the tax deduction. With regards to cash in your account, only withdraw as much from your HELOC as you wish to invest. So if it’s $2k/month then only withdraw that much at a time. In terms of income tax, line 221 is where you put your interest expenses. Your top ten tells me you are way too heavy on Canadian equities. They have severley under-performed a more globally diversified portfolio and you likely have lost 100-200K in total returns. Those interest rate sensitive holdings will get murdered this year. Thanks for the upbeat report Mike! :) My RRSP is almost 100% outside Canada, RESPs 75% outside Canada, Wife’s RRSP 100% outside Canada. But you are right, despite this, my largest account (corporate account) is invested in Canadian dividend stocks, which overweights Canada. Right now, we are about 35% outside Canada. Working on getting this number up to at least 50%. Oh no worries :-). I’m in the sameboat actually. Are you trying to get to that balanced position over a certain amount of time – say 12 months? I was tempted to correct my imbalance all in one shot however i’d be worried of buying into overpriced US markets while selling underpriced Canada. I think Europe and Asia are fairly or slightly underpriced. Oh well in both our cases we have about the same amount of dividends rolling into console us. My yield on capital is around 3.05% but that includes 35% allocation to cash, bonds and prefs. Hey Mike, I have the same feeling as you. It’s challenging to add a lot to US assets right now since they seem to be fully valued (or even overvalued). What is your strategy for deploying your cash? Honestly just plowing it into VXC. It’s such a perfect ETF for Canadian investors. I think it might be abit too exposed to US (50%) so i’m buying exposure to euro and asia markets via ETF’s as well to boost that up. Occasionally I will buy individual stocks if I see awesome value or potential. Next post: The Best of Million Dollar Journey: 2017 Edition!